The direct acting solenoid valves series "DM" are produced in the 3/2 N.C. pneumatic function with the interface to ISO 1 521 8 and in the 3/2 N.O. - 3/2 N.C. pneumatic functions with not standardized interface. These valves can be used with all the fluids that can match the constructive materials. The versions with nominal diameter of 1 .1 mm are equipped with "CRP" (Power Reduction Circuit, see documentation below). The direct acting solenoid valves series "UM" are produced in the 3/2 and 2/2 N.C./N.O. pneumatic functions. They are used as power valves if mounted on single and multi-station base, or as control valves if mounted, in the 3/2 pneumatic function, on body valves series "MEV", "MEK", or "UK". These valves can be used with all the fluids that can match the constructive materials. The multi-station bases support both the 3/2 N.O. than the 3/2 N.C. pneumatic functions. The direct acting solenoid valves series "UL" are produced in conformity with the Directives EC 89/336, EC 92/31, EC 93/68, EC 73/23 in the 3/2 N.O. (with feed from the exhaust "3") and 3/2 N.C. pneumatic functions. The function 2/2 is obtainable closing exhaust "3". Besides are available the versions with ports G 1/8, suitable for single use, and with interface for multi-station base mounting or for mounting on poppet and to ex CETOP RP 32 P (with ﬁxed position) valve bodies. The direct acting solenoid valves series "C/" are produced in conformity with the Directives EC 89/336, EC 92/31, EC 93/68, EC 73/23 in the 3/2 N.O. and 3/2 N.C. pneumatic functions. Using the same mechanic, it s possible to obtain four standard versions: side 22 mm - body ported, side 22 mm - body with interface, side 30 mm - body with ex CNOMO interface and body with interface for mounting on poppet and ex CETOP (with ﬁxed position and rotatable coil) valves. All the solenoid valves with interface can be mounted on single modular bases. Valves series “SK” are produced the size G1/8 in the following pneumatic functions: 3/2, 5/2, 5/3 and “3/2+3/2”. The electrical version can mount two kinds of piloting solenoid valves: the 15 mm one (type “SK815”) or the 22 mm integrated one (type "SK822”). Valves series “SK” can be used single or in manifold mounting, regardless the pneumatic functions: 5/3, 5/2 and 3/2, the last one using the adapter type “KIT/A/SK8”. The series “S8” is the new family of solenoid valves mounted on manifold bases whose integrated electrical part is capable of handling up to 32 signals thanks to the multi-pin connection. The valves belonging to this series are characterized by compact overall dimensions, high flow-rate and by a very smart engineering process resulted in just a few components needed for the assembly. The reduced overall dimensions allow to assembly the manifold both in a “vertical” or “horizontal” position, depending from the different mounting requirements. This series of valves comes with all the pneumatic functions requested by the market, including the “2x2/2” and “2x3/2” versions. They can comply with ATEX directive, 3GD category,upon request. Valves series "UK" are produced in the 2/2, 3/2 and 5/2 monostable pneumatic functions. In the 3 port solenoid control version with small pilot system, sizes G 1/8 and G 1/4, support the 15 mm direct acting solenoid valve (type UMCSV with ﬁxed position). Valves series "UDS ISO" are produced in the 5/2 and 5/3 pneumatic functions according to the interface to ISO 5599/1 standard and they are mounted onto single or manifold bases, bottom or side ported. The ex CNOMO solenoid valve, with manual override (screwdriver type C/UECSVB or button type C/UECSPB), in the solenoid actuated version is mounted with coil type USBG side 30 mm (that allows a greater yield) or type USB side 22 mm. Valves series "UDS CETOP" are produced in the 5/2 and 5/3 pneumatic functions according to the interface to ex CETOP RP 32 P standard and they are mounted onto single bases, bottom or side ported, or onto manifold bases, bottom ported. 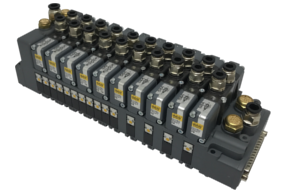 All the solenoid actuated versions support the 32 mm direct acting solenoid valve type ULCSV/R (with ﬁxed position) or the ampliﬁer valve type XVF4 for a sensible pneumatic piloting (see page 3.36). The solenoid valves series "W" can be directly actuated, servo-assisted or with mixed actuation. These solenoid valves, produced in the 2/2 N.C. pneumatic function, are used in several industrial ﬁelds, thanks to their compatibility with a large range of ﬂuids. Valves for vacuum series "EV" are produced only in the 3/2 N.O. and 3/2 N.C. pneumatic functions with solenoid pilot assisted actuation. Valves series "VM" generate vacuum using the Venturi effect. These valves found a speciﬁc employment in the aspiration from single work points with a suction cap.